This week we’ll be looking at (and/or listening to) a classic album from one of the greatest jazz drummers of the 1950’s, Art Taylor. He was born in New York City on April 6, 1929 and died there on February 6, 1995. As a teenager,Taylor played with Sonny Rolliins, Jackie McLean, Kenny Drew and others. After his first professional gig, with trumpeter Howard McGhee, Taylor went on to play with many of the greatest names in jazz, including Art Farmer, Bud Powell, Coleman Hawkins, Buddy DeFranco, Gigi Gryce and Donald Byrd, to name just a few. In 1963, Taylor moved to Europe and studied with Kenny Clarke for several years. He also found work playing with other American ex-pats such as Dexter Gordon and Johnny Griffin. At various times he also performed with Miles Davis, Red Garland, John Coltrane, and Thelonius Monk. Over the years, Taylor appeared on scores of recordings, both as a sideman and as a leader. One of his most highly-regarded albums was 1960’s “A.T.’s Delight,” his first album as a leader for the Blue Note label. Although the list of personnel includes a couple of unfamiliar names, the others should be enough to let you know that your ears are in for a treat! Although Taylor was also a prolific composer in addition to playing drums, only one of the six songs on “A.T.’s Delight” came from Taylor. The disk opens with the John Coltrane song, “Syeeda’s Song Flute”, an unusual title if ever I heard one, with an opening to match. About half a minute in, the guys settle into a hot groove that leaves no doubt in your mind that you are in for some of the best bop and hard bop around. 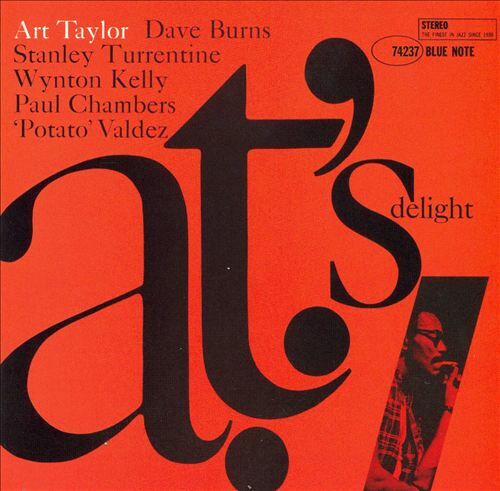 Turrentine’s sax is quickly joined by Burns on the trumpet, who takes the lead and runs with it for a bit until Turrentine again steps forward. The guys carry on a give and take musical conversation, and the language they’re speaking is pure bop. Up next is one of Thelonius Monk’s more well-known works, “Epistrophy,” penned by Monk and drummer Kenny Clarke. This one opens with Valdes’ conga, followed almost immediately by the rest of the group. In the interest of full disclosure, I must admit at this point that Monk is not my favorite artist, jazz or otherwise, and the atonal, discordant notes found in much of his music leaves me cold. However, if you ignore those parts, “Epistrophy” (or at least this version of it) is a wonderfully melodic piece of music, when it wants to be. Kelly really shines on this one. That is not surprising since he was a piano player who understood that the audience has to actually enjoy your music if you want them to come see you again and go out and buy your albums. “Move” was one of Best’s more popular compositions, and Taylor and Burns’ machine gun approach to the opening bars gives you more than a hint of what’s to come, it is what’s to come. When Turrentine takes over, it’s easy to imagine his fingers flying up and down the keys, a blur in the light of the recording studio. Then Taylor takes his solo and you swear he’s going to beat a hole right through those toms. Next we have “High Seas,” the first of two songs from trumpeter Kenny Dorham. Here we have no grandstanding, no jarring cacophony of sounds grating on the ear, just wonderfully melodic bop, beautifully played from the heart. Burns once again gives us his all, followed by Turrentine before Kelly’s piano takes over and makes it complete. In the penultimate song we finally find the only Taylor original on this album, the oddly named “Cookoo And Fungi.” I have no idea what motivated Taylor to write a song that is, for the most part, one giant drum solo, and give it that name. The fact is he did, for whatever reason, and here it is. If you’re a drummer, you’ll probably love it. Otherwise you may want to skip ahead to the final track. That brings us to “Blue Interlude,” the second Kenny Dorham song on the album. Once again we have landed in the land of bop, with all the pretension left in the dust and nothing but great music pouring out of the speakers. To learn more about Art Taylor and his music, check out his info page on DrummerWorld. The bio is Scot Yanow’s piece from allmusic.com, but there are also quite a few great photos of Taylor in action. Over on Wikipedia, there is a brief bio followed by an extensive discography you may find informative. The Hard Bop Homepage has another brief bio and an excerpt from Ira Gitler’s liner notes for “A.T.’s Delight”. Finally, the New York Times published an extensive obituary penned by music writer Peter Watrous a few days after Taylor died. ← Jazz For A Saturday Night: Who Am I And What Is This Place?